According to ChildHelp – an organization dedicated to the prevention and treatment of child abuse – over 3 million reports of child abuse are made each year in the United States. In her new novel “My Dear Rosa Jean” (published by Abbott Press), author Carin Jayne Casey shows readers just how deep the wounds of child abuse go, and how long into adulthood those wounds can take to heal. 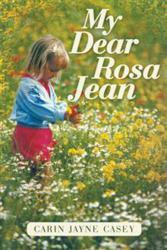 Rosa Jean knows little else outside of her life of uncertainty, unpredictable responsibilities and abuse. Violence shapes her life with her troubled parents – she has no hope for escape, nor does she feel that she is loved or even worthy of being loved. When she finally escapes the abuse and horrors of her childhood, Rosa Jean never expects to find love – yet she does find love as a happy wife and mother. But the demons of her childhood are not so easily left behind, and things crumble in a divorce and a string of unhappy and unfulfilling relationships. At her lowest and most vulnerable point, a cunning and charismatic man swoops in to take advantage of her. Rosa Jean marries this new man, who quickly shows his true colors, finding enjoyment through tormenting and torturing her. Somehow she finds a hopeful spark deep inside her, and she plans another escape from her abusive husband, finding real, unconditional love with her aunt, Grace, who shows her that she is a true child of God…and that she is loved. A native of Ohio, Carin Jayne Casey moved to West Virginia as a teen. She graduated from Radford University in Virginia, the state where she now lives. Her employment career is within business management. She is blessed with two children and four wonderful grandchildren. Abbott Press, a division Writer’s Digest—the oldest and most respected publisher devoted to the education and advancement of writers—is an indie-publishing imprint dedicated to helping writers bring their literary vision to print. Author Solutions, Inc., a leader in indie book publishing, will fulfill publishing, sales, and marketing services for Abbott Press. For more information, or to begin publishing a book today, log on to abbottpress.com or call 866-697-5310.